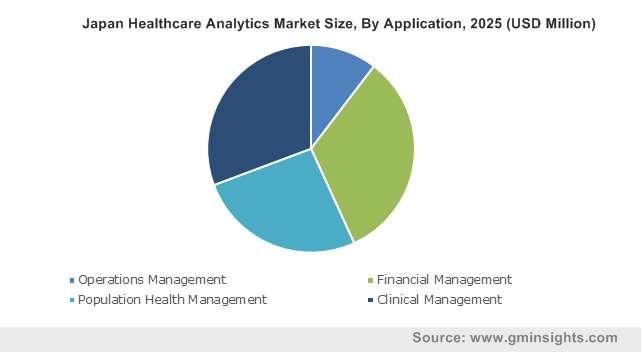 Healthcare Analytics Market size was valued at USD 7,932.4 million in 2018 and is expected to witness approximately 12.6% CAGR from 2019 to 2025. Growing need to reduce healthcare cost coupled with increasing application of healthcare analytics to provide real time solutions will lead to higher efficiency levels. Emergence of big data owing to the transition from paper charts to real time monitoring systems and use of electronic health records for collecting patient health data will boost industry growth. Rising awareness pertaining to personalized medicines would result in the generation and collection of huge volume of digital genome data driving the market expansion. Increasing usage of data sharing platforms such as social media platforms, blogs, and professional networks has allowed sharing health related information and obtaining peer opinions. This will increase the data available for healthcare analytics over the forecast years. Favorable government initiatives and increasing venture capitalist investments will augment business growth. Increasing funding to healthcare technology companies that developed mHealth apps, big data analytics, and Internet of Things (IoT) offerings will boost global market size. Technological advances facilitating information sharing and improved compliance to Health Insurance Portability and Accountability Act (HIPAA) patient data confidentiality standards will accelerate business growth. Novel approaches are used to develop effective therapies by focusing on discovery, safety and clinical trials output increasing the overall R&D productivity. However, lack of skilled IT professionals and issues pertaining to data integrity and safety should restrain the market growth. The inherent nature of healthcare industry hinders seamless data sharing among different providers due to privacy concerns. Lack of organizational procedures for integrating and sharing data and uncertainty of returns will further impede the industry growth. Descriptive analytics market is estimated to reach USD 9,001.2 million by 2025. The ability of descriptive analytics to analyse historical data and gain actionable future insights should favor segment growth. It is the most basic and widely accepted form of analytics which acts as a precursor for predictive and prescriptive analytics. 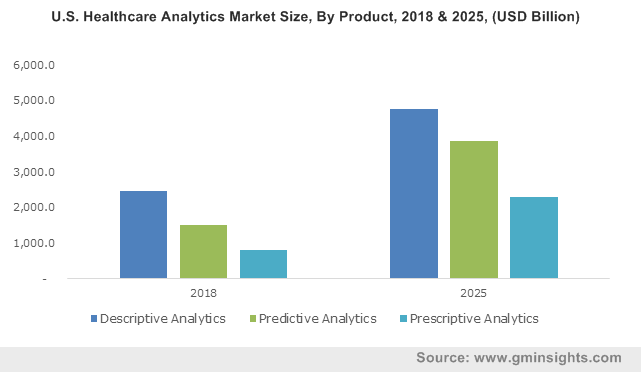 Prescriptive analytics business should witness lucrative 15.8% CAGR between 2019 and 2025 owing to its ability to predict about possible outcomes and its implications on key business metrics. It is comparatively complex in nature with few players optimizing it to achieve best outcomes by identifying data uncertainties. Healthcare financial management market is forecasted to surpass USD 6,078.0 million by 2025. Growing application of analytics to curb increasing healthcare costs and provide quality patient care attributes to its significant industry share. Extended use of analytics to detect and prevent healthcare fraud will further increase its demand across all healthcare organizations. Clinical management market should witness robust 12.9% CAGR over the forecast years. It enables to reduce healthcare spending by using data analytics solutions and improve access to healthcare provider networks. Increasing investors interest in clinical solution provider companies should accelerate segment growth. Hospital segment is estimated to reach USD 12,619.8 million by 2025. Healthcare analytics will help hospitals cut down on administrative costs, reduce fraudulent and incorrect payments, provide better care coordination and enhance clinical decision support. Clinic segment should witness growth of 13.2% CAGR across the forecast timeframe. Increasing usage of primary care analytics will enable physicians to identify areas for care improvement and build effective evidence-based practices throughout the healthcare delivery. U.S. market will reach USD 10,920.3 million by 2025. Presence of well-established healthcare infrastructure, increasing venture capital funding, acceptance of advanced technologies and widespread adoption of electronic health records across healthcare organizations will boost business growth. Moreover, presence of headquarters of major industry players in this region will further propel industry expansion. Japan market will show rapid growth of 11.8% CAGR throughout the forecast period. Rising healthcare expenditure, presence of advanced healthcare IT infrastructure and increasing initiatives for curtailing rising medical costs should propel business growth. Presence of EHR platforms and increasing adoption of predictive and prescriptive analytics across majority of hospitals should accelerate the industry growth. 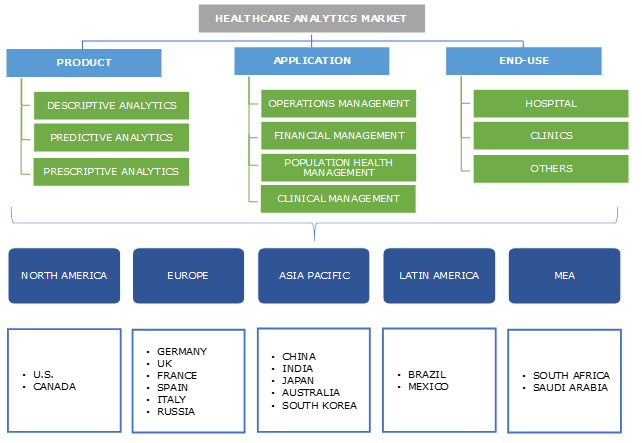 Some of the key players operating in the healthcare analytics market space include IBM, OptumHealth, McKesson Corporation, Allscripts Healthcare Solutions, Cerner Corporation, Athenahealth, Inovalon, Computer Programs and Systems, Change Healthcare, Tenet Healthcare Corporation, GE Healthcare, Evolent Health, Influence Health and Health Catalyst. Acquisitions, collaborations, partnerships, new product launches and geographic expansion are the most commonly adopted business strategies by healthcare analytics industry participants. For instance, IBM acquired Truven Health Analytics for approximately USD 2.6 billion enhancing IBM Watson Health business unit’s portfolio and broadening its client base. Healthcare analytics is an evolving concept and is anticipated to transform the nature of healthcare organizations in the near future. Increasing adoption and implementation of electronic health records in hospitals, clinics and other healthcare settings will favor healthcare analytics market growth. 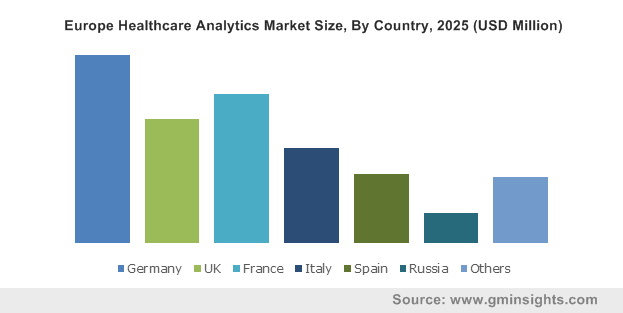 Usage of healthcare analytics solutions is widespread in developed countries. Economic development and healthcare infrastructure advancements in developing economies coupled with ushering in the era of digitization is anticipated to increase adoption rate in these regions. Industry players are investing immensely in R&D processes to offer unique platforms and solutions with enhanced features and gain competitive advantage in healthcare analytics market space.